There cannot be many villas in or around Lagos that combine all the following features. Peaceful countryside location for utter relaxation,you literally could hear a pin drop! Panoramic views over the Bay of Lagos at the front; Monchique hills at the side and the village of Portelas at the back. Easy access to the splendid old town of Lagos with its multitude of restaurants and bars - just 1 mile to the very centre, less to the Marina, plus a private full sized pool (10m x 5m) with spacious terraces, set in a lovely secure walled garden with large grassed area for ball games. Pool heating is available at a cost of £100pw. This villa works very well for three generations of a family and also perfect for two families, due to the annex. Very baby friendly, we provide all the kit to lighten your load - cot / play pen, high chair, digital baby monitor, steriliser and bottle warmer, even a few toys and a potty! New bathrooms recently installed and kItchen renovated. All bedrooms have ceiling fans, just as effective as air conditioning in the hottest months and much more environmentally friendly. Our villa has been inspected and awarded it's tourist licence 4401/AL. WiFi. The new motor racing track is just 1 stop down the motorway, but thankfully out of earshot! All channels of BBC,ITV,4,5 and many more besides, via broadband. There is also a catch-up facility. Free WiFi. All bedrooms on ground floor, plus 2 bathrooms, 1 ensuite, and downstairs kitchenette for poolside drinks and BBQ crockery. Marble stairs lead to upstairs sitting room with dining area and main kitchen. Also a. large terrace with outdoor eating area with fantastic views. Outdoors is a large pool surrounded by spacious terraces, a built in BBQ, a pergola providing a shady area and a large lawn suitable for ball games. At the back of the house is a car park and a citrus fruit orchard, lots of lemons for your G & T's! 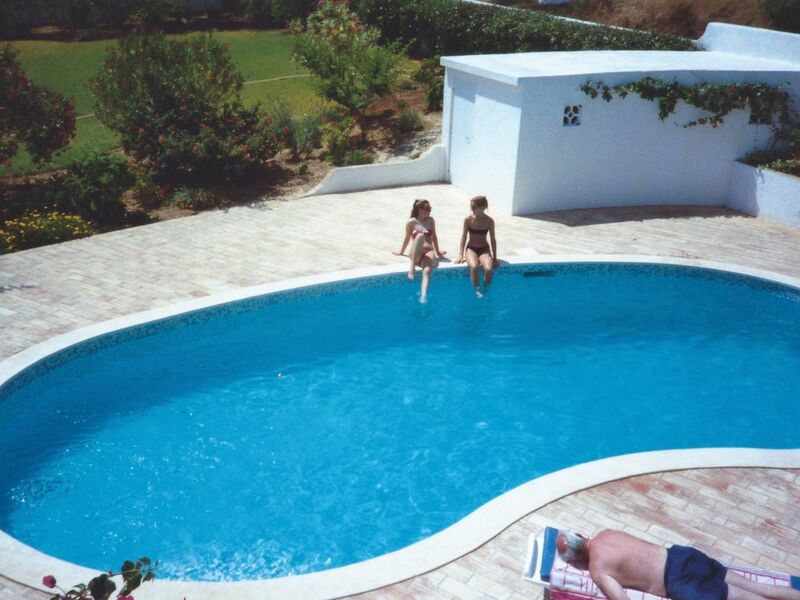 We first visited the Algarve in 1979 and instantly fell in love with the area and the people. We first stayed in Carvoeira and considered buying there but sadly realised that this charming little fishing village was about to be swamped by development. We then explored further west and after several visits to the area decided that Lagos was sufficiently large and predominantly Portuguese to avoid being swallowed up by developments. Then began the search for a villa nearby rather than in the town itself which can be noisy with barking dogs and late night bars etc.! We were extremely lucky in that the first villa sent to us was in just the right location, just 1 mile from the very centre of town with fantastic panoramic views of the ocean and mountains and yet in the peaceful countryside. I doubt there are many villas in or around Lagos that combine convenience of access to the many shops, bars and restaurants the town has to offer, with such blissful peace and quiet. We sit gazing at the views for hours both day and night and never tire of returning to Miradouro. The children love the pool,which can be heated in early and late season at extra charge when the water temperature is a mite too chilly except for the most hardy. The villa is very baby friendly as we provide cot, high chair, monitor, bottle warmer, steriliser, even a few toys and a potty! toilet, tub, shower, ensuite recently renovated.underfloor heating when cooler. En-suite bathroom to master bedroom. 2nd bathroom. Cloakroom. Additional en suite bathroom to 4th bedroom when booked. No air conditioning but ceiling fans, which are just as effective in the hotter months and much more environmentally friendly. Fan heaters available in all bedrooms and upstairs sitting room. Slow burning log fire in winter sitting room. Underfloor heating in bathrooms 1 and 2. In winter sitting room only. Free Wi Fi, but please note that it is very expensive to download in Portugal, so if you download films or music you will end up with a hefty bill! If you wish to do so, best to load up the dongle. For indoor use, please take your own beach towels for use by the pool etc. Spacious sitting room with dining area and patio doors onto large terrace with outdoor furniture and marvellous views. TV, DVD player, CD /radio and a small library of paperbacked books. fully equipped with plates, bowls, glasses and al types of utensils. Main kitchen fully equipped with fridge/freezer, cooker, dishwasher, microwave, electric toaster, coffeemaker, kettle and juicer, all crockery, glassware and utensils. Kitchenette on the ground floor with fridge for poolside drinks and barbecue crockery. Indoor and outdoor dining areas on first floor with panoramic views. Another dining area adjacent to BBQ area poolside. All channels of BBC,ITV,4,5 and many more besides via broadband. Catch-up facility. Small library of paper backed books. A few games and cards. Box of toys suitable for young children. Ask the maid for them. Beautiful walled garden with large lawn for ball games. Pergola providing a shady area. On first floor with table & chairs for 8 people and fantastic views. Lots of boat trips, dolphin watching and deep sea fishing. Large terraces around the swimming pool and BBQ. Large terrace on first floor with dining area and super views. Tennis club at bottom of hill. There are 5 championship golf courses in and around Lagos. Palmares, 18 holes, 5961m. par71 and Boavista, 18 holes, 6053m par 71 are both on the outskirts of the town. Penina, Parque da Floresta and Alto are all within a 15 minute drive. Palmares has now got an additional 18 hole course. Pool may be heated for £100pw and has a cover. Notes on accommodation: The bedrooms are all on the ground floor. The main kitchen and sitting room are on the 1st floor. All bedrooms have large fitted wardrobes and hand-painted furniture from the Alentejo region of Portugal. Winter lets include use of winter sitting room with slow burning log fire. The villa is equipped with fan heaters,underfloor heating in bathrooms and electric blankets. It has a current gas safety certificate. If you wish to use the baby kit, please take your own bottles and teats. . Tourist licence. It is now the law that all rented properties must have a tourist licence and all health and safety requirements must be installed. Some if these may seem a little silly i.e. a large sign proclaiming 'that a life guard is not on duty' - profoundly disappointing those expecting a bay watch babe!- however it is most important that this licence be obtained otherwise the property can be closed down. Our villa has been awarded it's licence alojamento local. Outside: Walled front garden very secure for children, with private kidney shaped pool (10m x 5m) surrounded by large terraces with sunbeds, table, chairs and built-in barbecue. Pool heating is available at a cost of £100pw. Large lawned area ideal for throwing frisbees around and pergola providing shady area. Car park at rear with citrus orchard in back garden - lots of lemons for your gin and tonics! There are 8 sunbeds and mattresses, a large outdoor table and 8 chairs. Utility Room: The utility room has a washing machine, iron and ironing board. Cleaning / Towels / Linen / Maid service. There is a management service to deal with all formalities and any local difficulties. All bed linen and bathroom towels are provided - please take your own beach towels for use by the pool etc. Other: Winter sitting room/bedroom 4 with en-suite bathroom. This is a very large room with sitting area and fantastic view to the Monchique hills. This room closed in the summer months unless booked as an extra bedroom. It is never let separately. Lovely Villa in a great location. Communications with owner and agent very easy. An ideal family holiday with a great heated pool. Thank you so much for your review. It does help us very much. So pleased that you enjoyed your stay and we hope tom see you again in the future. Lovely villa with great views and utter silence, very relaxing. The heated pool was a bonus. We were delighted to arrive after a long journey and were not disappointed. The villa was very clean and welcoming, the maid had put the heaters on so it was nice and warm inside as well as out. We explored the house and found everything needed for a great holiday. The pool looked fantastic and we quickly got ready for a swim which was lovely. We found a very good taxi firm which came to collect us every evening, so no need to worry about drinking and there was an ample supply of taxis to bring us back the fare being a very reasonable 5/6 euros. We followed the recommendations re restaurants in the owners local notes and found these very reliable without exception. We spent most of our time lounging around the pool at the villa but did venture out to beaches now and again and explored further afield towards the west coast. We were particularly fond of Ingrina and Salema on the way and the beaches up the west coast are all very stunning and almost undiscovered. The beach bars are all very good, but it's a shame they have all been made to conform to certain rules which has robbed them of their individual style. Nearer to home, we particularly like the restaurants at Porto de Mos, as you are right on the beach and can enjoy spectacular sunsets. It is worthwhile going inland through Portelas and up to Bensafrim then twirl around and go back through Barao St Juao and St Miguel, an unspoilt area of the Algarve unchanged by time. In short a great holiday with lots of variety . This villa is in an ideal location with good amenities the owners are clearly very passionate about ensuring their guests comfort. The villa is clean and tidy and sports two luxury bathrooms which are new additions this year. The maid Antonia is very thorough and it's really lovely to fully relax knowing the day to day tasks are taken care of. Great place and wouldn't hesitate to come back or recommend to others. wonderful to know that you had a great holiday. Thank you for your review. The situation of the villa is stunning with wonderful panoramic views. Even in December we were able to sit out on the upstairs terrace with the bougainvillea still in bloom & admire the extensive vista. The pool area & gardens are spacious & well maintained & would be idyllic in the warmer months of the year, for those who like the heat, though it was warm enough to sit out a few times even in the dead of winter. We were there for a month. It's so peaceful. We are keen birdwatchers & with hoopoes, azure-winged magpies & owls visiting the garden frequently, it suited us perfectly. The management company was very helpful & if there was any kind of problem, it was dealt with immediately, but nearly all the information we needed was in Mrs Purefoy's very comprehensive notes. Two new bathrooms had just been installed & we had the pleasure of being the first guests to use them. For this time of year the underfloor heating & the heated towel rails were very welcome. We had time to explore the whole area, mostly the wild & rugged landscape & beaches west of Lagos & up in the Serra Monchique. We found the villa an excellent base for our excursions. For anyone interested in bird watching, we found the estuary & lagoons immediately south of Mexilhoeira Grande very rewarding, but there are lots of good areas in the vicinity, for example in Sagres & beyond at the Cabo de Sao Vicente. The only downside is that in the winter, since the villa is designed to keep out the searing summer heat, it was pretty chilly in the mornings & the evenings. There is a log fire, but it did take a while for the place to heat up in the evenings. We were always out most of the day, so weren't lighting the fire till later. However we got quite used to it. It's amazing how quickly you adapt. All in all we had a thoroughly enjoyable holiday & would go back without any hesitation. Thank you so much for your lovely review, it is great to know that you had a good holiday. We love Miradouro and it is wonderful to know that others share our view. I loved the views and peaceful location and the pool is great however it is in need of a deep clean and updating. The curtains in my bedroom we so old they were stained darker at the position of opening from years of never being washed. The top of the head boards were caked in thick dust that had been there years. The bath mat looked like it had not been changed since the 80's and my sons bedding had holes in it. Some of the lamps didn't work in the lounge and the wires were all frayed. I'm by no means a clean freak I would have just expected a higher standard for the price. Wifi did not work and the management company told us to buy a dongle even though villa is advertised as having wifi, then we discovered by chance that the password in the visitors info is incorrect! If you want a quiet out of the way villa with fantastic outdoor space it's for you but don't expect luxury on the inside. Oh dear me! I am so sorry you were not satisfied. I can assure that the curtains ARE WASHED every year without fail and I will prod the maid to dust the headboards more often. I understand that you did not wait to see the management representative who would have been able to sort out the WiFi for you , she would also have been able to replace duff lamp bulbs ( I do mention this specifically in my notes, pointing out that the maid is not there after dark and wouldn't notice such things). I will certainly get some new bath mats also and we are replacing the bed covers in the side bedroom. Once again apologies for our perceived failings. Faro airport is 78km (approx. 45 mins drive) via Motorway A22 to Lagos. Car hire is strongly recommended for convenience, but not absolutely essential. Lagos town: 1.5km. Portelas village: 0.5km. Praia da Luz: 7km. Burgau: 12km. Sagres: 28km. Miradouro is very well furnished and equipped with telephone, Wi FI, digital English TV,including BBC, ITV etc. CD/cassette player, DVD player, personal safe, hairdryer and a small library of paperback books. There are ceiling fans for the summer months. It has a distinctly Portuguese flavour as we have furnished and decorated with the works of local craftsmen wherever possible whilst still providing all 'mod cons', personal safe, dishwasher, microwave AND a daily maid to deal with all household chores so Mum can have a holiday too! Lagos (pronounced Lah-Gosh!) is quite different to most other Algarve resorts. This is no purpose built resort nor over-developed fishing village, but an ancient Portuguese town, its heritage well preserved by the local council. Tourism now plays an important part in its prosperity but by no means overwhelms it. The old men still gather to set the world to rights and you need only stroll a short way from the centre to find rambling cobbled streets or the old city walls surrounding the town. The town centre is just 1.5km away. Visit the new marina to admire the yachts, stroll along the palm fringed promenade overlooking the fishing harbour and the old Fort jutting out into the sea, the old slave market (now an art gallery) and the Church of Santo Antonio with its regional museum. It is the favourite holiday town for the Portuguese themselves, which ensures good value for money and Portugal itself is one of the cheapest countries in Europe. In short, it is a spacious Portuguese town with something for everyone. There are numerous restaurants to suit all pockets and tastes, various supermarkets and all varieties of shops. In and around Lagos are facilities for sailing, windsurfing, surf boarding, waterskiing, scuba-diving, deep sea fishing, boat trips, tennis, squash, riding , dolphin watching and, for the really adventurous, microlight flying! A comprehensive guide to local facilities is sent to all booking the villa. Booking Notes: A deposit of £100pw will secure the booking with the balance to be paid not later than 8 weeks before departure. A refundable security deposit of £100 is taken on arrival to cover keys and breakages. This can be paid by cheque with a guarantee card. Changeover Day: Saturday preferred during the summer. Variable during the winter. The villa is available from 2.00pm on the day of arrival to 10.00am on day of departure to enable the maid to do a really good clean between lets. Notes on prices: Prices are for the property per week in UK Pounds. Summer prices (Easter-October) are for up to 6 people. Supplement for extra bedroom is 20% of appropriate rental. Pool heating is available at a cost of £100pw. Winter prices (November-March) the price shown is for long lets of 6 weeks or more. 3-5 weeks is £395pw; 1-2 weeks is £455. Single week lets including Christmas or New Year, add £150pw, this does not apply to longer lets. Winter lets include winter sitting room with log fire. Rate 11 and Rate 19. - The rate of £345.00 is for long let of 6 weeks or more. - For 3-4 weeks the rental is £395.00 pounds. - For 1-2 weeks is £455.00. Additional Charge: - The main house sleeps 6 people, for larger parties the annex which sleeps an additional 2 people is available for 20% more. Cancellation charges. Deposit is non refundable. 8-6 weeks before departure 30%, 5-3 weeks before departure, 50%, 1-2 weeks before departure, 100%.